The Golden Section appears in Nature in endless variations.  Judaism, at its earlier stage, emphasized the importance of Nature. The Bible is full of descriptions of the land of seven species and four seasons. King David was a nature child and many Psalms are nature hymns. On the other side, the Golden Section is a dynamic ratio: The ratio 1.618…, between two following numbers, is always an irrational number without an end. The rational order created by our mind is only a little fraction, a shutter or a blind, in a giant spiral of irrational phenomena. Any methodical thinking about the Golden Section brings, naturally, to recognize chaos and order as fundamental aspects of the cognition. At the same time that it create harmonies, the Golden Section create constant search after new harmonies and restlessness, similar to that of the Jewish people. The Pyramids, the Parthenon and Pantheon, were the temples of the Jewish people enemies in the ancient period. The Jewish religion heralded a new, more progressive, moral age. Is it possible that the Golden Section was forgotten along the way? Are there any connections between the Golden Section, Judaism and the Holy Land? 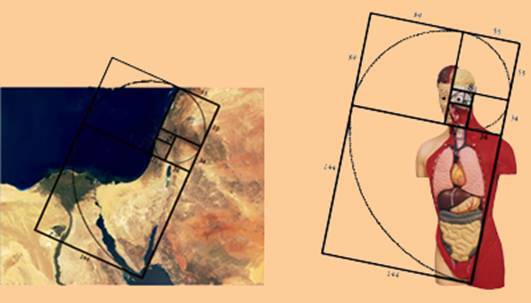 The photos below shows golden rectangles placed on the Land of Israel including Sinai Peninsula, and the human body. Comparisions between an anatomy model and satellites photos of the land. The photo on the right shows a wonderful resemblance between the torso's organs and Sinai Peninsula's regions. In Sinai Peninsula there are only three major geographic regions: Vadi-el-Arish basin, A-Tia plateau, High Mountains. In the human torso there are only three major organs systems: lung-heart, liver-stomach, intestines. The Geographic shapes resembles amazingly to the torso's organs: The upside down triangle shape, the parts size ratios, the mass accumolation downward. 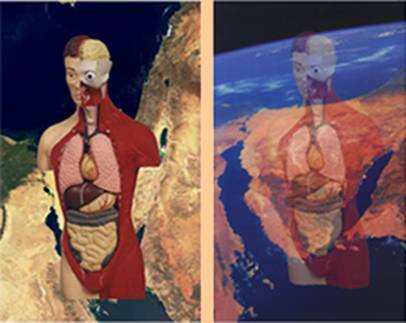 The photo on the left shows the general size ratio between an averagre anatomy model and the Geographic region in the photos below it. The north border is aproximatly above the Litani River. Lake Kinneret is parallel to the eye. The Dead Sea area is parallel to the place of the thyroid Gland. The lower border for the comparision is the southern edge of Sinai Peninsula. The correlations are not precise. Some prception flexibility is needed.